All items handcrafted by Olde Mountain Miniatures Co. in the United States. The miniature Harmony Forge hardware and the miniature leaded windows are 1/12 scale reproductions of significant pieces found in museums and in private collections. The forge pieces duplicate the rough surfaces created by the blacksmith's hammer. These pieces are handcrafted from pewter alloy for detail, strength and longevity for the discriminating collector. Most items are finished to represent wrought iron, cast iron or antique tin ware. Items include - door, cabinet & chest hardware, hinges, fireplace andirons & accessories, cookware, lighting, shutter hinges, fences, wall shelves and more. Leaded stained windows for new construction or retrofit to any dollhouse. Choose from our stock window designs or I will create for your custom window any size and design you wish. 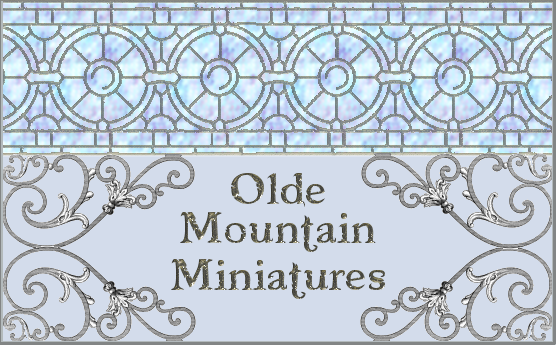 Michelle Hapner is the owner and the handcrafter behind Olde Mountain Miniatures. She has been in the Miniature Industry just about her entire life with her parents being in the miniature business. At the current time Michelle attends the Aztec wholesale trade show.